For only the second time in 150 years, a late third century/early fourth century mosaic depicting Orpheus encircled by animals charmed by his lyre music is going on public display at the Bristol Museum and Art Gallery. The mosaic will be on display until January 12th, 2014, and starting next month, will be a glamorous companion for Roman Empire: Power and People, an exhibit of 160 of the British Museum’s Roman artifacts. This 16-square-foot Orpheus mosaic is one of nine Roman floors found in Britain that show Orpheus playing inside a circle of animals, including the massive Great Pavement of Woodchester and the Barton Farm mosaic in Cirencester. It’s thought to be the oldest of the nine. Orpheus sits on a bench in the center of the mosaic wearing his characteristic Phrygian cap as he plays his lyre. A fox jumps up next to him while seven animals — a lion, doe, bear, bull, panther, leopard and stag — cavort around him. 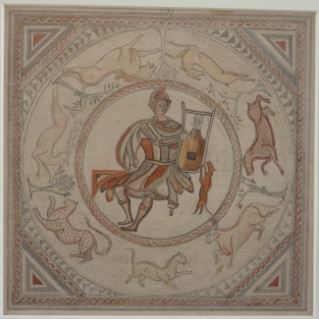 Although Orpheus charming the beasts was a common motif in art all over the Roman world, only the British mosaics place him inside a circle of animals. The Bristol mosaic was discovered in 1837 during construction of the Great Western Railway in Newton St. Loe, a village between Bath and Bristol. 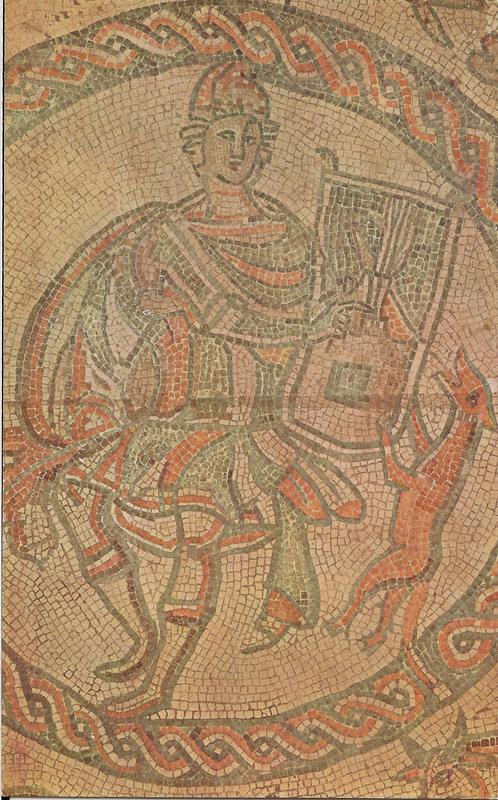 It adorned the floor of a large Roman villa where other mosaics were also found. The discovery of precious ancient remains could not be allowed to derail the railway plans; the villa would be destroyed by the construction. Railway engineer Isambard Kingdom Brunel envisioned saving the mosaics for a new museum he would build to house the artifacts they encountered during the Great Western project. To that end, he dispatched trainee engineer Thomas Edward Milles Marsh to carefully record the mosaics in situ and lift them off their floors. 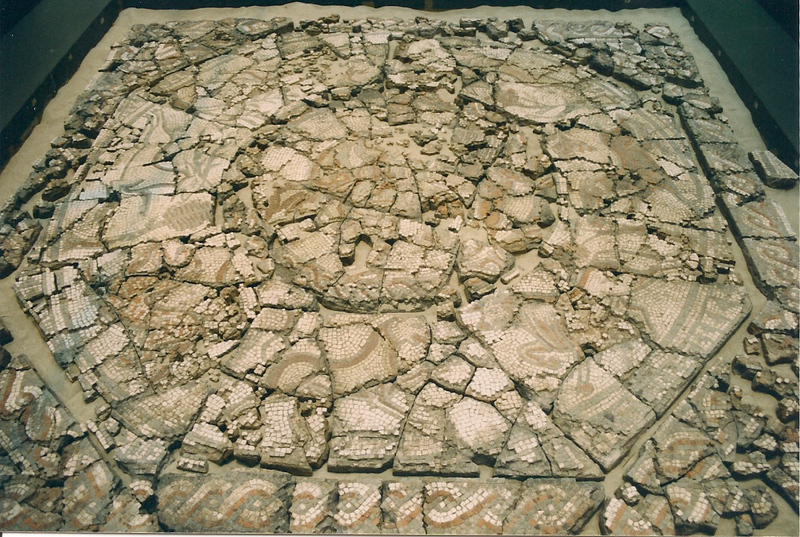 The museum never came to pass, so instead the Orpheus mosaic was installed in Keynsham Railway Station floor where it remained by all accounts in excellent condition until 1851. We don’t know why or who made the decision, but in 1851 it was decided an ancient mosaic didn’t belong in a railway station so it was removed and donated to the Bristol Institution, precursor of today’s Bristol Museum and Art Gallery. It would have been better for the mosaic had it stayed in the station. Again, details are sketchy, but it seems that the mosaic was removed in chunks using pick-axes. The sections were packed into tea chests and kept in storage until the new Bristol Institution museum was built. The museum moved several times after that and the tea chests moved with it, but they weren’t packed properly and the mosaic sections were damaged in transit. By the end of the 19th century the museum’s exhibition space was full and there no interest in making room to finally put the mosaic on display. Its purview was more natural history than archaeology, so most of its antiquities were in storage. The mosaic was so little valued that by 1906 the museum lost track of it and thought it was gone for good. The mosaic was rediscovered in storage by the museum’s Curator of Archaeology, G.R. Stanton, in the 1930s. The once-large sections were in fragments. He spread out the contents of the boxes on the basement floor in attempt to piece Orpheus back together. He was greatly aided in 1936 when Thomas Marsh’s daughter donated her father’s archives to the museum. Marsh had kept his documentation of the Roman villa, including a life-size tracing of the mosaic in situ, a detailed watercolor of Orpheus and a complete floor plan of the villa and all its mosaics. Unfortunately Stanton’s efforts were not supported by the powers that be at the museum. When he left, the fragments he had been able to puzzle together were packed back up and sent to a series of storage spots where they were stashed in offensively inappropriate conditions. Some were kept in a shed that burned down. Some were left outdoors and the mosaics collapsed from the frost. Some found themselves in the path of trucks which drove over them. Some pieces were only about three tesserae across. Others had lost all tesserae but the mortar gave the game away. I would photograph pieces that looked interesting and then at home pour over copies of the black and white photographs Stanton took of the animals. By chasing oddly shaped tesserae with a jeweller’s eyeglass, I could often identify where a small piece had come from on a figure, and could identify where bits fitted in the jigsaw. In 1999, the museum reached out to ASPROM to see if Beeson would be up for trying to put this crazy puzzle together again for the millennium. 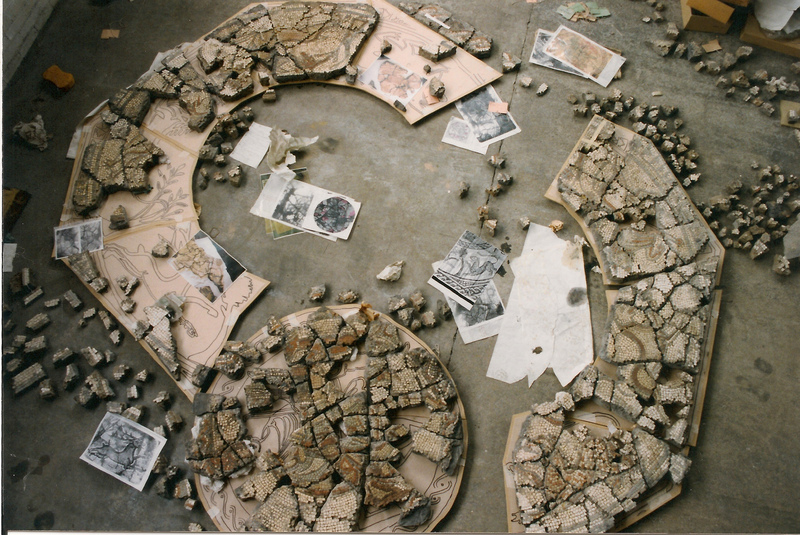 He agreed, on condition that they intended to treat the mosaic reverently from here on in, and in July of 2000, all the pieces of the Orpheus mosaic were laid out in the front hall of the museum. There, in full view of visitors, they put together this massive jigsaw puzzle. It took them five months. 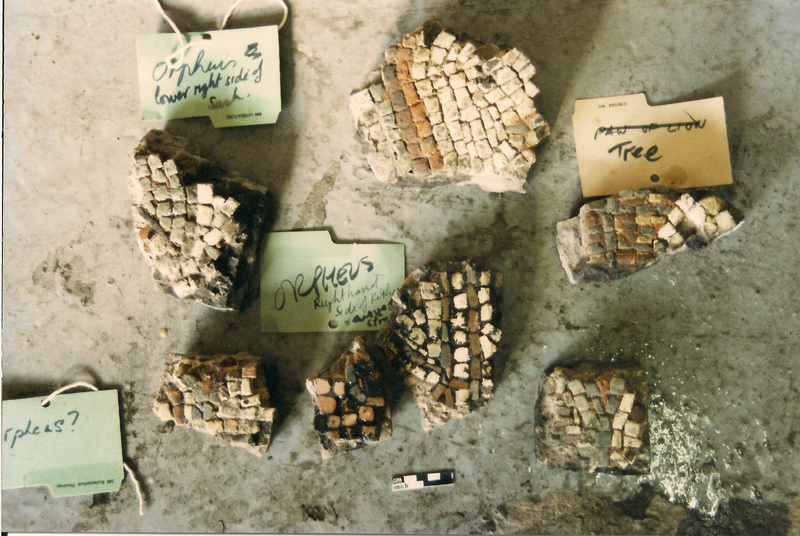 In December 2000, the mosaic fragments were affixed to panels to keep them in their proper positions and then stored on shelves in the basement, in real conservation conditions this time. That made raising Orpheus from the underworld of the museum basement a much more manageable proposition this time around.